Caption - Bagnall heaven in Southern India. Mysore Iron & Steel (later Visvesvaraya Iron & Steel) had two foot and metre gauge steam. 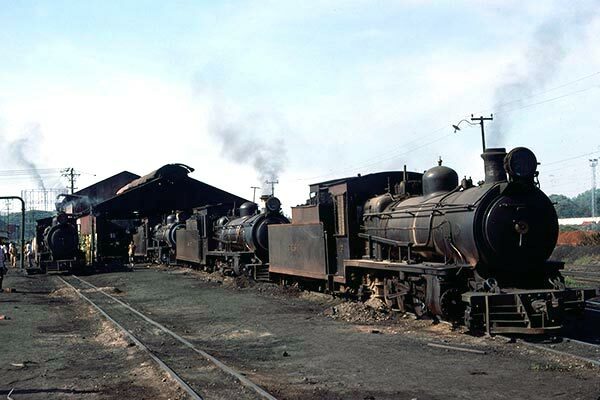 This image shows 4 of their 5 Bagnall 2-8-2s outside their two foot gauge shed in March 1978. They are nos. 13, 11, 15 and 14 - 15 was built 1957 and the others in 1950. They were very similar to Kerr Stuart built locos delivered in 1922. During the visit the manager asked about Bagnalls. He had sent an order for another two locos but had no reply. Bagnalls had, of course, closed to steam construction by then.